Philadelphia's progressive power metal outfit MORTANIUS are getting into the holiday cheer with their new lyric video for their cover of WHAM's "Last Christmas." The track is one of five that will appear on the band's debut album "Till Death Do Us Part" that will be released on Rockshots Records on February 22, 2019 to follow EPs "A Voice From Beyond" (2016), "Savage Garden" (2015) and "Ethereal Waltz" (2014). "With 'Last Christmas' we decided to emphasise the more melancholic nature of the lyrics while still keeping the 80s pop feel of the song. So instead of being a bouncy 80s pop song, it has become a slower 80s power ballad. The chorus is backed up by big choirs, and the guitar solo is very emotional." vocalist Lucas Flocco said. MORTANIUS, a progressive power metal band with symphonic and neo-classical elements was formed in 2013 by ex-Outlander vocalist Lucas Flocco and drummer Victor Cardone who were joined by guitarist Mike Gissi and bassist Jesse Shaw. From 2014 to 2016, the band recorded 3 EPs, each one steadily increasing the band's online presence and fan base. In 2016, after the release of their third and most successful EP at the time, "A Voice From Beyond," drummer Victor Cardone departed from the band. 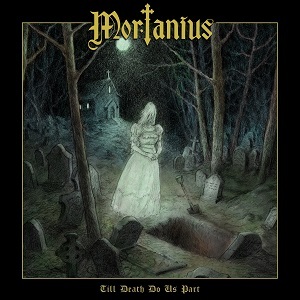 A year later in 2017, MORTANIUS returned to the studio to create their first full-length album, "Till Death Do Us Part." Ollie Bernstein (Ousiodes) recorded all lead guitars on the album, while AJ Larsen (of Madison Rising, Vicious) handled rhythm guitar duties. MORTANIUS also reached out to renowned power metal singers, Leo Figaro (Minstrelix, Dragon Guardian) and Jonas Heidgert (Dragonland) to provide guest vocals. "Till Death Do Us Part" featured the longest production cycle out of any of MORTANIUS' previous releases, finally wrapping up production a year later, in the fall of 2018. This album features MORTANIUS' most fully fleshed out and dynamic compositions, tightest performances, and highest quality production to date. Vocalist Lucas Flocco said, "The album features a mixture of progressive and power metal. The songs all have melodic vocals that sing catchy lines. Choirs and harmonized vocals are featured heavily. Lead guitars shred fast and harmonized beautifully with each other, and the rhythm guitars are tight and intricate. Keyboards play an integral part to the sound of the album, providing atmospheric flavour and sometimes carrying the main melodies."